John Erik Pandolfino, MD, is Hans Popper Professor of Medicine and chief of Gastroenterology and Hepatology at Northwestern University Feinberg School of Medicine. 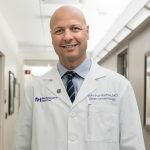 A native of Brooklyn, New York, Dr. Pandolfino has cultivated an extremely impressive career with a research focus on studying the biomechanics of bolus transport (where a mass of food has been chewed to the point of swallowing) and gastrointestinal motility as it pertains to gastroesophageal reflux and swallowing disorders. He developed the Esophageal Center at Northwestern Medicine, which serves as the nation’s top referral center for complex esophageal diseases, such as achalasia, eosinophilic esophagitis and refractory Gastroesophageal Reflux Disease (GERD). Dr. Pandolfino has authored numerous guidelines and opinions for the medical community on the management of these disorders, in addition to publishing more than 200 scientific papers focused on gastrointestinal motility and esophageal diseases. He has an active physiology lab at Northwestern and is currently funded by the National Institutes of Health to study GERD and dysphagia pathogenesis. Dr. Pandolfino also receives funding from industry to develop new technologies to investigate and treat gastrointestinal disorders. Although no one in my family was a doctor, I’ve wanted to be a physician since I was very young. I think this stemmed from my interactions with my pediatrician when I was a child and the fact that my parents slightly brainwashed me by purchasing a chemistry set and invisible man model. Early on, I wasn’t always the best student, and things could have turned out differently. As my third grade teacher wrote in my report card summary, “John will either be a master criminal or governor one day.” I guess becoming a doctor was a pretty good alternative. 2. Why did you choose GI as your specialty? Somewhat randomly! During my residency, I was interested in physiology and procedures and debated back and forth between GI and Cardiology. In the end, something drew me to GI. It wasn’t until a family party many years later that I realized why I became a gastroenterologist. My father’s family was involved in the construction and plumbing trades, and my uncle informed me that I was basically just a fancy plumber who worked on the human body. I guess in the end I stayed in the family business! 3. What are your research interests, and what are you hoping to discover? My research interests focus on studying bolus transport through the gastrointestinal system so that we can better understand diseases associated with dysmotility, such as GERD, swallowing problems, gastroparesis and irritable bowel syndrome (IBS). Our work utilizes biomechanical paradigms mixed with mathematical models and physiologic studies to search for the abnormalities that lead to symptoms and poor function. This has enabled our work to deliver a greater impact beyond the esophagus, as the stomach, small intestine and colon will follow the same principles. Our work will also improve our ability to care for patients with other diseases, such as inflammatory bowel disease (IBD), chronic constipation and refractory nausea and vomiting, as bolus transport is important in all of these disease processes. 4. Do you have any mentors who helped you find your way? My main mentor is Dr. Peter Kahrilas, who was the Division chief when I was a fellow. Although I knew I wanted to stay in academic medicine and be involved in research, I was torn between working in a basic science lab and performing clinical research. Dr. Kahrilas was doing sophisticated physiologic work, a combination of basic science and clinical medicine, and this seemed like the best of both worlds. In addition, this approach allowed me to continue to have an active clinical role as many of the patients with complicated diagnosis we see in our practice are also subjects in many of our research trials and physiologic studies. Dr. Kahrilas taught me how to generate important questions from my clinical practice and develop research studies to directly improve patient outcomes. We have termed our approach “translational physiology,” because our observations and studies directly impact patient care today. 5. What do you do when you are not at the Northwestern Medicine Digestive Health Center? In 2016, I married my college girlfriend, and we now live on the North Shore with my daughter, son and our Valley Bulldog, Buffy. My favorite thing in the world is to be able to spend time at home with them and focus on the kids and their activities. When I do have spare time, I love to box, although that has shifted to attending Pilates classes with my wife. My love of boxing led me to found a nonprofit, which raises money to support educational and youth development on the west side of Chicago. We offer a boxing program to help inner-city youth get off the street and learn discipline. I also love to travel, and my job gives me the opportunity to travel internationally as a visiting professor and speaker at various specialty conferences. I love Europe because each country is so unique, and the art and history are amazing. My favorite country to visit is France, though my favorite food is pizza! I love bread and cheese, which made becoming a vegetarian much easier.